José Gregorio Castillo…his favorite place to eat is Chipotle and his favorite show is Family Guy...his all-time favorite athletes are Jose Altuve and Cristiano Ronaldo...considers representing Venezuela in the 2017 World Baseball Classic as his biggest baseball accomplishment...originally signed by Rays scouts Marlon Roche and Ronnie Blanco. Split the season between San Antonio (AA), El Paso (AAA) and SD, making his ML debut on 6/2 and recording 37 appearances out of the SD bullpen...Made 12 appearances out of the SA bullpen to begin the season, posting a 3.00 ERA (5 ER, 15.0 IP) with five saves before being promoted to ELP on 5/14...His only earned run with ELP came in his AAA debut on 5/14 at Reno…did not allow an earned run across his next nine outings (10.1 IP) with three saves before earning his first call up to the big leagues on 6/2...Became the third pitcher in SD history to strike out the first three batters he faced in his ML debut on 6/2 vs. CIN (also: Jeremy Fikac in 2001 and Tommy Layne in 2012)... Earned his first ML victory in his second career outing on 6/6 vs. ATL, tossing 1.2 IP of one-hit ball in SD's 3-1 victory...Was scoreless in 10 of his first 13 outings from 6/2-7/4 with a 2.84 ERA (4 ER, 12.2 IP) before being placed on the 10-day DL on 7/7 with a strained right hamstring...Did not allow an earned run across three rehab outings for ELP...was reinstated from the DL on 7/28...Posted a career-best 9.2 scoreless-IP streak across nine outings from 8/21-9/12...Struck out each of the three batters he faced on 9/12 at SEA...his three strikeouts were part of a franchise-best nine consecutive strikeouts among relievers, along with Robert Stock, Craig Stammen and Trey Wingenter... His .170 opponent average led the SD bullpen and ranked sixth among all NL arms that made at least 35 appearances...Did not allow a run in 27 of his 37 outings for SD...Posted a 3.22 ERA (8 ER, 22.1 IP) and a .154 opponent average on the road compared to a 3.38 ERA (6 ER, 16.0 IP) and a .193 average at home...Posted a 1.69 ERA (3 ER, 16.0 IP) and a .130 opponent average against NL West opponents... Limited opposing hitters to a .146 AVG with a 1.54 ERA (2 ER, 11.2 IP) in one-run games...Allowed just one hit to the 24 batters he faced in full 3-2 counts…his .056 opponent average in those scenarios ranked 10th best among all NL arms...Allowed just one hit, a walk and no runs in his 3.0 IP in extra innings...Relied on four pitches: four-seamer (54.9%), slider (44.8%), changeup (0.2%) and cutter (0.2%). 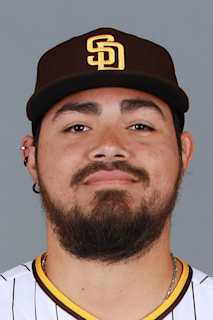 Split the season between Lake Elsinore (A) and San Antonio (AA), pitching to a combined 4-2 record and a 2.88 ERA (18 ER, 56.1 IP) with 59 SO against 26 BB in 47 relief appearances...Spent the majority of the season with Lake Elsinore where he went 3-2 with a save and a 2.87 ERA (15 ER, 47.0 IP)...Allowed nine earned runs across his first six outings and 8.0 IP (10.13 ERA) from 4/6-21 for Lake Elsinore...allowed just six earned runs in his remaining 33 appearances and 39.0 IP (1.38 ERA) from 4/25-8/5 for the Storm...Promoted to San Antonio on 8/9 and did not allow a run in his first six appearances for the Missions...allowed three earned runs across his final two appearances...Tossed 0.2 scoreless IP in his lone postseason appearance in Game 1 of the Texas League semifinals on 9/9 at Midland...Represented Venezuela in the 2017 World Baseball Classic in March...earned the save in Venezuela's first win of the tournament, an 11-10 first round victory in 10 innings over Italy...in the opening game of the second round against the United States, entered in the sixth inning and struck out Christian Yelich and Nolan Arenado to end the frame and protect a then 1-0 lead...Following the season, played for Navegantes del Magallanes of the Venezuelan Winter League and posted a 3.52 ERA (3 ER, 7.2 IP) in nine relief appearances. Split the season between Tri-City (A), Fort Wayne (A) and Lake Elsinore (A), pitching to a combined 2-2 record and 2.03 ERA (9 ER, 40.0 IP) with 49 SO against 12 BB in 20 relief appearances, working exclusively in relief for an entire season for the first time in his career...Began the season with Tri-City and tossed scoreless outings in four of his five relief appearances before being assigned to Fort Wayne on 7/4...Tossed multiple innings in eight of his nine appearances and also allowed an earned run in six of his nine appearances with Fort Wayne, posting a 2.28 ERA (6 ER, 23.2 IP) with 35 SO to just four BB...Struck out a career-high nine hitters in 4.2 IP and earned the win in the TinCaps' 4-3 victory in 15 innings on 7/30 vs. Lansing...Assigned to Lake Elsinore on 8/15 and allowed just one earned run in two of his seven appearances, posting a 1.59 ERA (2 ER, 11.1IP)...Following the season, played for Navegantes del Magallanes of the Venezuelan Winter League and did not allow a run in 14 relief appearances. Split the season between Tri-City (A) and Fort Wayne (A), posting a 4-2 record with a 3.74 ERA (33 ER, 79.1 IP) in 19 appearances (18 starts). Made three relief appearances for the GCL Rays (R) and posted a 3.86 ERA (2 ER, 4.2 IP)...Acquired by SD from TB along with INF Wil Myers, C Ryan Hanigan and RHP Gerardo Reyes as part of an 11-player, three-team trade that sent RHP Burch Smith, C Rene Rivera and INF Jake Bauers to TB and RHP Joe Ross and a player to be named later (INF Trea Turner) to WSH on 12/18. Made his professional debut for the GCL Rays and posted a 2-2 record with a 5.87 ERA (20 ER, 30.2 IP) in 12 appearances (three starts). 1 de marzo de 2019 San Diego Padres ponen a LHP Jose Castillo en la 60-d&iacute;a lista de lesionados. Left flexor strain. 28 de julio de 2018 San Diego Padres activan a LHP Jose Castillo de la 10-d&iacute;a lista de lesionados. 21 de julio de 2018 San Diego Padres envian a LHP Jose Castillo una asignaci&oacute;n de rehabilitaci&oacute;n a El Paso Chihuahuas. 7 de julio de 2018 San Diego Padres ponen a LHP Jose Castillo on the 10-d&iacute;a lista de deshabilitado retroactivo al July 6, 2018. Right hamstring strain. 2 de junio de 2018 San Diego Padres llamado LHP Jose Castillo de El Paso Chihuahuas. 14 de mayo de 2018 LHP Jose Castillo asignado a El Paso Chihuahuas de San Antonio Missions. 29 de marzo de 2018 LHP Jose Castillo asignado a San Antonio Missions de El Paso Chihuahuas. 11 de marzo de 2018 San Diego Padres opcionado LHP Jose Castillo para El Paso Chihuahuas. 20 de noviembre de 2017 San Diego Padres seleccionado el contrato de Jose Castillo de San Antonio Missions. 9 de agosto de 2017 LHP Jose Castillo asignado a San Antonio Missions de Lake Elsinore Storm. 22 de marzo de 2017 LHP Jose Castillo asignado a San Diego Padres. 27 de octubre de 2016 LHP Jose Castillo asignado a Navegantes del Magallanes. 15 de agosto de 2016 LHP Jose Castillo asignado a Lake Elsinore Storm de Fort Wayne TinCaps. 3 de agosto de 2016 LHP Jose Castillo asignado a Fort Wayne TinCaps de Tri-City Dust Devils. 1 de agosto de 2016 LHP Jose Castillo asignado a Tri-City Dust Devils de Fort Wayne TinCaps. 4 de julio de 2016 LHP Jose Castillo asignado a Fort Wayne TinCaps de Tri-City Dust Devils. 7 de septiembre de 2015 LHP Jose Castillo asignado a Tri-City Dust Devils de Fort Wayne TinCaps. 1 de septiembre de 2015 LHP Jose Castillo asignado a Fort Wayne TinCaps de Tri-City Dust Devils. 15 de junio de 2015 LHP Jose Castillo asignado a Tri-City Dust Devils de Fort Wayne TinCaps. 28 de mayo de 2015 LHP Jose Castillo asignado a Fort Wayne TinCaps de AZL Padres. 6 de abril de 2015 LHP Jose Castillo asignado a AZL Padres. 19 de diciembre de 2014 Tampa Bay Rays cambian a CF Wil Myers, C Ryan Hanigan, LHP Jose Castillo and RHP Gerardo Reyes a San Diego Padres for C Rene Rivera, RHP Burch Smith and 1B Jake Bauers. 19 de diciembre de 2014 LHP Jose Castillo asignado a Fort Wayne TinCaps. 12 de mayo de 2013 LHP Jose Castillo asignado a GCL Rays de VSL Rays. 20 de febrero de 2013 Jose Castillo asignado a VSL Rays. 7 de julio de 2012 Tampa Bay Rays agente libre firmado Jose Castillo.